I came across Professor G D Agarwal’s name when I was in the final year of BTech in Civil Engg at IIT Bombay. This was year 1978. I was researching on where to do a Masters in Environmental Engineering. My batch-mate Renu Gera who had moved from IIT Kanpur to IIT Bombay, recommended IIT Kanpur and mentioned Professor G D Agarwal. “He is a very senior Professor and a rather strict and a strong personality. But he is the right person to write to” she said. I wrote a letter to Prof Agarwal on a post card asking about the Master’s program in Environmental Engineering at IIT Kanpur. I asked how this program compares with some of the international graduate programs, especially in the United States. Honestly, I did not expect a response. In the next two weeks, I received a letter from Professor Agarwal, typed on the letterhead of Civil Engineering Department of IIT Kanpur. The letter was very considerate to my questions and elaborated the curriculum and ended stating that Master’s program at IIT Kanpur was comparable to most of the top masters programs in the United States. Professor Agarwal encouraged me to apply to IIT Kanpur. Eventually, I joined the Masters Program at IIT Bombay. By then Professor P Khanna had joined IIT Bombay from Roorkee University and I thought that I will be at good hands by working under his guidance. One day, while sitting in Professor Khanna’s office, a person walked in, wearing a simple dress. I saw Professor Khanna rising from his chair and touching his feet with respect. “Oh, stop this Purushottam” said the stranger. He was clearly embarrassed. Professor Khanna then introduced me and said “Prasad, meet Professor G D Agarwal of IIT Kanpur”. That is how we met for the first time. It was July, 1979. In January 1980, Professor Khanna called me to his room. “Prasad, I need you to support Professor G D Agarwal for a one week training program on Wastewater treatment. He needs an assistant to help him to handle the logistics like reproduction of course materials and ensure that the participants are well looked after. This will be good opportunity for you to be with Professor and learn”. At that time, I was completing my Masters dissertation. I readily agreed to Professor Khanna’s proposition. I later came to know that Professor Agarwal had resigned from IIT Kanpur due to his differences with the Administration. A bit expected I said to myself. My job started with a task to receive Professor Agarwal at the Mumbai Central Station and reach him to the IIT Guest house. He was arriving by Rajdhani express from New Delhi. I went half hour before the arrival of the train. Some of you may be aware that many times, there are touts moving on the Railway platforms who do all kinds of tricks to whisk away young boys by administrating an anaesthetic. As these touts noticed me lingering alone on the platform, they circled around. Indeed, I was in trouble. Just then Rajdhani express came thundering in and the passengers started alighting. I was already a bit dosed with the anaesthetic and feeling giddy. In the next five days, I was an obedient assistant to Professor G D Agarwal. He gave me his set of notes that I got neatly typed on the cyclostyling paper (a duplicating technique only known now to the “old generation”!). I used to get cyclostyling done at a place called Datye Copiers and Ammonia Prints near to the Dadar (Western) railway station. Lectures by Professor Agarwal were so amazing that I still cherish. His style of teaching was “minimal theory”, just to introduce the “basic science” but focus more on infusing the practice. Clearly he was more of a hands on person, “action oriented” (unlike most of us! ), very precise and rational, and rather explicit and opiniated in drawing conclusions or making summary statements. He was the sole speaker for all the 5 days – and the participants loved his style of course management. There were not just lectures but also exercises. I understood his personality and convictions in those 5 days. Professor took a good liking for me and spent time advising me on my career post the day long lecture sessions. Looking back, this was the progeny from the Berkley school. Professor Agarwal graduated in civil engineering from the University of Roorkee (now IIT Roorkee) and later obtained a PhD in environmental engineering from the University of California at Berkeley in a record time of 2 years. His PhD thesis was on “Electrokinetic Phenomena in Water Filtration,” with Professor E A Pearson. Those were the golden days at Berkeley with presence of Professors like David Jenkins and several others. When I asked Professor Agarwal, how did he complete his Ph D research in a short time, he said that it was sheer difficulty of managing vegetarian food in those days that made him work hard and harder! During the IWWA convention in Delhi, Professor G D asked me whether I could accompany him to Kandhla, his farm in Muzaffarnagar district. I said “Well Sir, I will have re-book my railway ticket to Mumbai, but I will do it.” I remember I placed a STD trunk call home from IIT Delhi Guesthouse and spoke to my father. I stood in a long queue at New Delhi Railway station to re-book my seat. When we reached the farm in Kandhla, Professor G D took me to a garage or outhouse like structure. He asked me to open the locks and raise the rolling metal shutter. Inside the room, all I saw was books. They were stacked all over and there were two stools right at the entrance. “Prasad, you will sit here” said the Professor pointing to one of the stools. And over the next three days, Professor G D introduced to me some of great books in environmental engineering, his notes and assignments while at the University of Berkeley. It was an opportunity I got that I will never forget – listening to his wise words. In this collection of books, I came across signatures of Harvey Ludwig, another great environmental engineer, who also studied at the University of Berkeley. (Subsequently I met Harvey in Bangkok and we spoke about Guru Das Agarwal, as he knew him). Professor Agarwal interacted with me during my doctoral research at Asian Institute of Technology I Bangkok. He was the member secretary of the Central Pollution Control Board then. He invited me to work with him on River Ganga after returning to India. And I did. Professor G D resigned however due to difference of opinion with Chairman Niloy Choudhuri. Professor Niloy Choudhuri was more of a policy & strategy person while Prof Agarwal was a person of action. Later, I had opportunity to work with him on an assignment in Dhaka for the Government of Bangladesh in framing the national regulations on environment. There were occasions where we were together as speakers in training programmes, seminars and conferences. I vividly remember sessions we did at the Administrative Staff College of India. Professor Agrawal’s students remember him with admiration, awe and affection. In 2002, his former students at IIT-Kanpur conferred on him the Best Teacher Award. He has guided many Masters and Doctoral students who are now leaders in the field of environmental engineering and science. Among his prominent students was the late Anil Agarwal, the pioneering founder of the Centre for Science and Environment, New Delhi. He helped mentor well-known development activists including: Dunu Roy (IIT Bombay,’67) of Hazards Centre, New Delhi, Ravi Chopra (IIT-Bombay,’68) of People’s Science Institute, Dehra Doon and Rajendra Singh, a Magsaysay awardee and founder of Tarun Bharat Sangh. Professor Agrawal embraced ‘sanyas’ at Sri Vidya Mutt in the 79th year of his age. After ‘diksha’, he became Swami Gyanswaroop Sanand. Unfortunately, I could not remain in touch with Professor G D. We never met after this last and brief encounter. GD was notable for a number of fasts undertaken to stop many projects on River Ganga. His fast in 2009 led to the damming of the Bhagirathi River being stopped. GD lived a Gandhian lifestyle in his spartan, two-room cottage in Chitrakoot, Madhya Pradesh. He swept his own floors, washed his own clothes and cooked his own meals. He retained only a few possessions and dresses in handspun handwoven khadi cloth. These are the deliberate choices of a devout Hindu with respect for simplicity in living and reverence for nature. GD died on 11 October 2018, after being on an indefinite fast since 22 June 2018, demanding the government act on its promises to clean and save river Ganga. It’s amazing how positive influence works…..you have been doing the same with your students and staff as well. I remember the numerous evening sessions with you in CESE IIT as well as at EMC where you used to take us through the lives of stalwarts in the field of the environmental field – authors, engineers, academicians and their work. Salute to the great Prof. GDA ! Met him once in Dehradun. Requested him to take a look at my masters dissertation. He smiled. 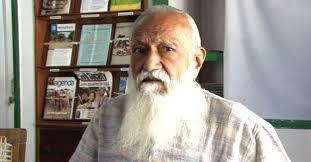 RIP prof. G D. May the officials of NGBRA, CWC, CPCB and MOEF&CC get a part of his devotion to restore Ganga. Saw (not met) GDA once in Anil Agrawal,s place (office? ), during the early phase of CSE . New nothing about GDA, except that everyone around looked at him in awe. Much, much later, I knew more. I had the opportunity to meet GD sir a number of times. He was a man of high conviction and integrity. I was Regional Officers at Alwar during which a distillery was being set up at Alwar and public hearing for Environmental Clearance was scheduled. GD sir came to know about it and wanted to attend the hearing. The project proponent came to know and did not wish that GD sir attend the hearing. He managed to get the hearing postponed. GD sir came for the hearing several times, but could not participate as every time, it was postponed. Eventually, hearing was conducted when. I was on leave and no one informed him about the hearing. In another case, he prepared EIA report on behalf of his client for setting up of a fertiliser plant in Rajasthan and concluded that the proposed site is not suitable for setting up of the plant!!! Such was his uprightness. I do not know if any of the consultants can have the courage to do it today. India has lost a true champion of environment. Apt tribute to a passionate crusader for regeneration of natural resource to pristine glory and a true guru. I used to work for Excel Industries Ltd. then (Prof. was Member Secretary, CPCB) and he was highly appreciative of Kaka’s (KC Shroff of Excel) approach of Land Application of treated industrial wastewater by growing receptive species of trees and convert waste into wealth. And we proposed to let this approach be used in larger measures by Indian Industry. While appreciating Kaka’s approach and commitment, he said that I know Indian Industrialists and they will make a good escape plan by throwing every pollutant on lands and damage soil environment. And I can let you follow this approach but not Indian Industry in large! Respect this great Engineer and Pray for his soul. Very nicely summarised blog. This gives wonderful glimpses of the character, conduct and persona of this great man. I will share this blog post with all our students, scientist and staff to read. Further, I wish to comment on very peculiar aspect: Agarwal saheb kept on resigning from various portfolios from time to time in his life journey and struggle. Some one could have interpret negatively and opined that he didn’t accomplish his goals in that job profile and bailed out without struggle in that organisation/institution. Some one may interpret otherway that he was not greedy or insecured of a settled life (as most of the service/job oriented people are concerned of settled or secured job in their life these days and even earlier days). Looking at his life in a holistic way, I interpret that perhaps he was neither of the above said types. He was a man on mission and for him a institution/organisation was not the sky to define his limits. His sky and limits was the ‘ultimate benefit to society’ by any means possible, which he experimented and lived all his life..
A respectful salute to him and his life..
Pranams to the memory of Prof. G.D. Agrawal Sir, a great Environmental Engineer and a man of high integrity. I had an opportunity to meet him at IIT Kanpur in December 2004 during the International Conference on the 20th Anniversary of the Bhopal Gas Tragedy “Bhopal Gas Tragedy and its Effects on Process Safety” December 1 – 3, 2004. He made very precise queries to the author of a paper dealing with the monitoring of ground water quality around the Bhopal plant. Very sad to know that he is no more. I am a class-fellow and friend of Guru Das and have experienced much of your description of him but came to know about the academic wealth stored at Kandhla from your blog, Dr Modak. India needs such a great professors..